When you think about the top American hockey programs in college there’s a few obvious schools that come to mind such as Boston University, Michigan, Harvard, Yale and North Dakota. All are steeped in tradition with either national titles, rabid fan bases or are playing in expected hockey markets. But what would say if I told you that another program in the desert is making strides to one day be at that level and currently is one of the most dominant teams in the league that they play in? It’s true, and the school that is making waves right now in college club hockey is the University of Las Vegas of Nevada, aka UNLV. Las Vegas has just recently become a major pro sports city but for decades it’s been a huge college one at the NCAA level but not too many know about their recent impact in the club hockey scene. Club hockey, if you’re not too familiar is non varsity level hockey is not run by the NCAA but it has it’s own governing body in America with schools such as UCLA, the University of Oklahoma and Oregon taking part who in hockey are not in the NCAA system or who are working their way to one day play the sport at the highest level collegiality south of the border. The Skatin’ Rebels currently play in Division II of the American Collegiate Hockey Association’s Mountain West Collegiate Hockey League and were formed in 2005. This year’s edition of the squad has been one of the most dominant in the league, regularly racking up 10+ goals a game which their coupe de grace being a two game home series vs Southern Methodist University by which they won both games to the tune of a combined score of 33-3. The 2016-17 campaign would be the best in school history as they’d finish the regular season 28-7 and 3rd overall in the West region. 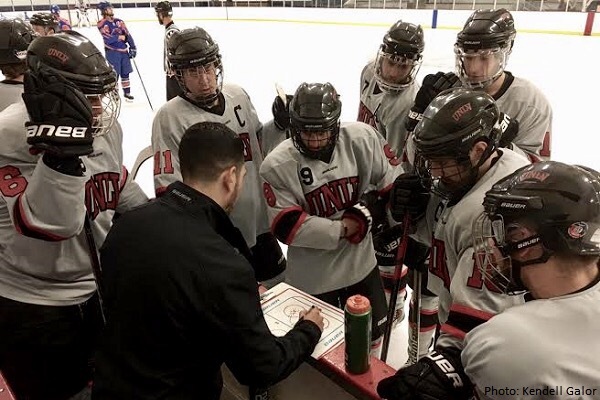 UNLV’s roster is a mix of Americans, Europeans and Canadians with local talent throughout the roster as six skaters hail from the Las Vegas area. One of those said Las Vegas products in the form of forward Cody Williams led the team in scoring with 34 goals, 40 assists for 74 points during the regular season. The goaltending duties didn’t fall onto the shoulders of just one as a trio stepped up as Erik Eidissen, Terry Martin and Alex Freese all had save percentages of over .915 and had at least nine wins on the season, with Eidissen leading the way with a record of 12-5. UNLV also became the first hockey team to get a crack at playing at the brand new T Mobile Arena before any NHL team as they hosted Arizona State’s club team back in October 2016. Sure having a spiffy new arena can hold anything and it will attract an audience but non NCAA level hockey getting thousands of people through the doors for club hockey is very impressive in a non traditional market. This past weekend the program also made history by beating Metro State University and Denver University in the ACHA West division regionals in Greeley, Colorado to qualify for the first time in school history for the ACHA Nationals being held in Columbus in mid March. Going into nationals and making noise would be absolutely incredible for a program that in 2017-18 will be playing in Division I of the ACHA and hopefully soon Division I NCAA hockey. With Alabama-Huntsville and Arizona State becoming NCAA hockey members don’t for a second laugh at the idea of UNLV joining them very soon. Desert hockey very much has a pulse at multiple levels.